Organisational notes on the French communist groups Socialisme ou Barbarie, ICO and Echanges et Mouvement, by Henri Simon in 1998. 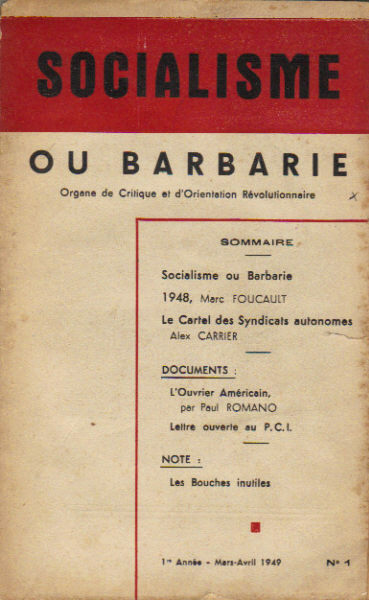 The split of Socialisme ou Barbarie in 1958 was about organization. After the de Gaulle coup d'etat in May 58, there was an influx of members into S ou B. These are mainly students fighting against the Algerian war because of the draft. The number of members jumped up suddenly from less than 20 to more than 100. The problems of organization that had previously been discussed almost constantly became a practical problem and not simply theoretical speculation in a narrow circle. This problem was closely connected to a political analysis with two contradictory positions (this opposition never appeared publicly in the review, but could be seen in the internal bulletins): on one hand a majority followed, for a short period, Chaulieu (Cornelius Castoriadis) in foreseeing a workers' revolt against the "fascism" of de Gaulle; on the other hand the minority said that de Gaulle was there to solve the problems of French capitalism and to end the Algerian war. - the majority following Chaulieu wanted to create cells which would meet from time to time in a general assembly to define the group's policy and to elect a political board which would have the function to implement the adopted policy. The members would have had to defend the position of the majority in public and to follow it even if they disagreed. Disagreements would have to be contained inside the group as a whole or in the cells. - the minority wanted to promote autonomous workers cells where all problems would be discussed, even the general line discussed in general assemblies. Everybody could express his own ideas at any moment and through any means. It should be said that neither the majority nor minority followed what they were looking for on paper. Socialisme ou Barbarie was active up to the end of the Algerian war (1962) and then started a slow decline. This decline began after the split of Pouvoir Ouvrier, when Chaulieu openly dropped Marxism, and the group disappeared in 1967 after a totally wrong political statement on the impossibility of a general movement in France. other committee was transformed into the ICO. The structure of the ICO was a practical structure rather than a political or theoretical structure. In a certain way it was what the ILO dreamed of building when it split from Socialisme ou Barbarie: Most of the participants of the regular meetings were informal militants of informal factory groups. The ICO paper reported the situation and struggles in each factory according to the regular meeting reports and there was a kind of consensus around autonomous activity rather than a political statement. Participants were from various origins, anarchists, Marxists, or non- aligned militants, but linked by a strong feeling about class struggle. Interest in other struggles in France and abroad developed with more contacts, and from time to time in more general discussions, but the group, though slowly growing, stayed small up until 1968. In 1968 a lot of people, again mostly students, became connected with the ICO. The ICO became a kind of federation of small groups scattered all over the country. During the 15-day May General Strike, everybody was strongly involved in the struggle at his place of work and everybody then agreed not to act like a group "organizing the workers" but to encourage autonomy wherever he was. After 1968, the character of the ICO had completely changed. The group had become more of a political organization with perhaps several hundred loose participants. The workers were a minority and voted with their feet as the discussions were moving very far from their struggles. Several tendencies were fighting to lead the ICO toward a specific orientation and after four years it burst into several pieces. One of these pieces was Echanges. It was again different of what we had seen previously. Echanges was built to try and maintain the close international links created during the previous period in several European countries (mainly through international meetings). This was the reason why from the start Echanges had an edition in English and was based more on England rather than France, and more on individuals in each country connected with, an informal circle of supporters. Now after more than twenty years Echanges is more centered on France, with a small group meeting regularly mainly to discuss politics in general, struggles and the content of the bulletin. Two years ago, on the proposal of an American comrade we started a short news bulletin which appears every two months, with a print run of up to 3000 copies. It is distributed free and seems to be the start of a new basis of relations again all over the country. The experience of the past twenty years has taught us practically what some theoretical discussions had put on the table: there is presently no room for the kind of traditional organization for which many people are still looking. For the time going "organization" is more a kind of network in which everybody, or some affective groups, defines at any moment their participation in a struggle or in a publishing activity and the connection between others doing the same thing. We don't think or don't know if it will be a permanent thing and if something else will appear. We think that in this important question, we have to follow (knowing exactly what we don't want as workers), but not to precede, to learn and to tell what we have understood and not to teach.